March 5, 2008 - Make sure you like EcoJoes on Facebook to stay updated on green ways to save money and help the environment. Just click the "like" button below. Muchas gracias! 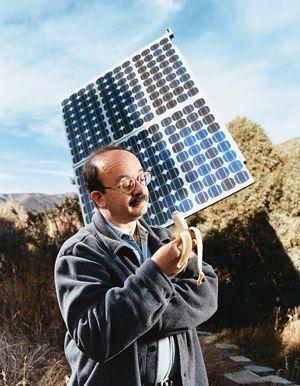 Amory Lovins, who won a MacArthur Genius grant back in 1993 (and an Eco-Hero Award just right now), has been living in a house he built since 1983. It looks like a very nice and comfy house, especially when you consider that, despite living 7,000 feet up in the Rocky Mountains (where it gets pretty dang cold), he pays $0 a year on his heating. Not only that, but his house actually generates more electricity than he needs — so he sells the surplus energy to the power company for some extra cash. Here are three ways to cut your electric bill like crazy. His secret (one of them) is that he designed his house to be very well insulated. His walls are 16 inches thick, and his large super-insulated windows (made with special glass that insulates as well as 14 normal panes of glass) mean that his house can retain heat quite well. Lovins’ house is heated in two main ways: both from sun-rays passing through his many windows, or by means of Amory’s solar panels, which supply his house with more energy than it even uses. Much of Lovins’ house is naturally lit by the sun. Besides that, motion-detector lights and energy-efficient bulbs help to cut down on electricity use. His fridge is thickly-insulated, which reduces its energy consumption by quite a lot. His dryer is solar powered, and looks like it uses no electricity at all (watch the video to see how). Amory Lovins’ home took some extra thought to design and build. It also cost a little bit extra ($6,000). But by cutting his power bill to zero, the extra planning and money spent were easily worth it. If more and more contractors start building this way, you could kiss our “oil prices” and “energy crisis” problems good-bye. Posted in eco footprint, eco hero, energy conservation, green construction, green living, off the grid, save money, solar power	on Wednesday, March 5th, 2008 at 4:42 PM. Sounds very interesting and I agree with you on house insulating and energy efficient appliances. The sole point on which I disagree is about building houses like this would solve the problem. Of course, this would help, but not that much. To the research I done on France, insulating the 31 million existing houses is a priority as they consume way too much. spread the word, spread the word! Thanks, ecojoe–I've sent your site to 20 people, who ought to get on it–and each get 20 more. Gotta save our poor old mother earth…. Thanks!!!! If everyone kept spreading it to 20 new people, EcoJoes could eventually be seen by every single person on Earth! Dang, imagine what kind of world THAT'D be. Wow that was a great idea to save power and save our mother earth. Thanks for the handy tips. Actually, in my house, I'm experiencing excessive electric bills every month. So, I'm looking forward to following the electric bill saving ideas provided in this post. Should you traveling with little ones a good deal, an iPhone could be helpful to you. It is possible to install a handful of video games onto it to maintain your kids busy on extended car trips, or even just although waiting in series in the food market. It will help keep them happy and from your hair. Buying electricity-successful light bulbs is a great way to reduce costs and use eco-friendly energy at home. These light bulbs require a pair a few minutes to use their highest illumination. This delay will allow less energy to be utilized when switching on the lighting fixtures at your residence, which is the best way to save electricity! Pleasing a denied medical insurance declare can be quite a very long, pulled-out procedure, along with the clever patient never ever submits exactly the same appeal a second time. When numerous is of interest are essential, the individual should take note of the effects each and every appeal produces. An excellent attractiveness is definitely customized to manage not merely the first state denial but in addition any troubles raised from prior appeals. There are lots of reasons behind eyebrow hair loss, including way too recurrent eyebrow plucking and employ of eyebrow pencils, and also aging. In case your medical doctor establishes that your eyebrow thinning is caused by getting older, you could use eyebrow cosmetic products to cover the hair reduction. If it’s brought on by specific medical conditions, you can utilize eyebrow Rogaine to lessen decrease. Many small business owners manage their own income and expenses. It's a good idea to manage your expenses yourself in an effort to cut overhead costs – but how you do it matters. If you are using spreadsheets to store expenses, you might want to give it a thought again. Here is why.